This is to inform all students of the Ambrose Alli University, AAU Ekpoma that the sales of course regularization forms has commenced for students with wrong or incomplete course registration details starting from 2014/2015 sets. There will be REGULARIZATION OF COURSE FORMS ONLINE effective from 2014/2015 academic session to enable students personally address all pending issues associated with previous incomplete or wrong course registration. Result processing will be strictly based on courses registered online. Changes on courses registered cannot be reversed hence absolute caution should be taken before making changes. Students are strongly advised to consult with their course advisers to avoid irreversible errors during this process. The two possible categories of students for regularization of course forms are designated with A and B below. Kindly follow the instructions where applicable. The instruction below is applicable to students who have existing course forms on KOFA. ¶ Click “My Data” tab at the top of the page, select “Study Course”, Click on any level of choice e.g 100. ¶ Click “Repair Course List”: this will enable you add or remove courses from your course form (“Add Course Ticket” or ”Remove Selected Tickets” buttons). 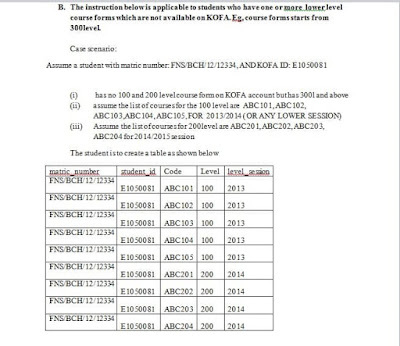 (iii) Assume the list of courses for 200level are ABC201,ABC202,ABC203, ABC204 for 2014/2015 session. IN SUMMARY, IF YOUR 100 LEVEL HAS 20 COURSES , LIST THE 20 COURSES AS SHOWN in the Table (which is in the Image below) . Do SAME FOR 200L.. THE CANDIDATE in the table (which is in the Image) HAS ONLY FIVE COURSES IN 100LEVEL AS EXAMPLE, HENCE THE FIVE COURSES WERE LISTED. Send the table to courseforms@aauekpoma.edu.ng. Then edit available sessions as indicated in “[A]” above. The schedule for regularization is scheduled to hold between Tuesday 26th February 2019 to Tuesday April 16th 2019.